Last May I stood in a field in Langemarck, just north of Ypres. Preserved there are many canisters which had contained the chlorine gas used in the first gas attack in April 1915. The realisation that my father had been in the same field 100 years and 11 days earlier made my hair stand on end! Later that day there was a huge crowd some 40 minutes before the Last Post Ceremony at the Menin Gate in Ypres. Amazingly this happens every day and on special anniversaries the crowd is even bigger. Following the Last Post, sounded by the Ypres Fire Brigade buglers, the silence was intense before being relieved by the bright tones of Reveille. 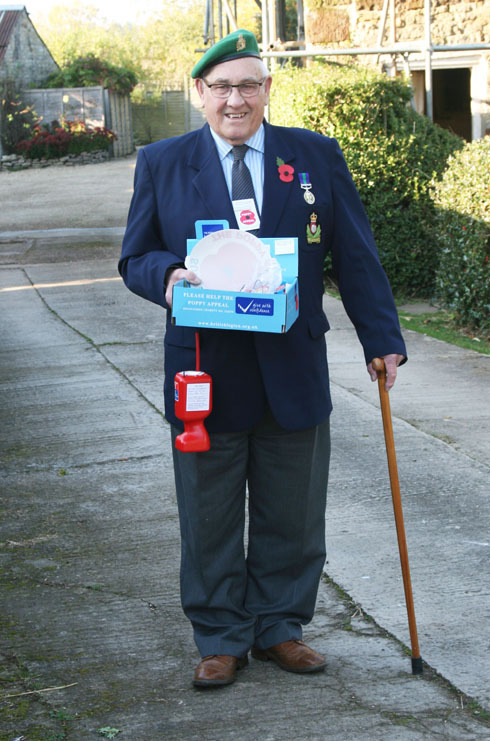 When collecting house to house I found that some of you already had poppies – from work or supermarket etc. However, you all seemed pleased to see me and were unstintingly generous. Many of you donated several times – at the shop and at the memorial service. I am sure the Vicar’s inspiring sermon played a part here. God bless you all for your generous response to this vital cause – you donated a shattering £924.20 – absolutely wonderful! The stories of those from the village who lost their lives in two world wars can be read on the next page. A.W. Berry, W.E. Carpenter, W. Fenemore, A.W. Franklin, R.C.W. Hadley, F. Jeffs, J.W. Muddiman, L. Shellard, W. Smith, Lilian A.M. Taylor, J.R. Tyrell, F.G. Wade, H.J. Webb, Leslie Whitehead, L. Whitehead, G.E. Whitton, H.L.J. Wootton, H. Wootton. William Carpenter was the son of Mr W.T. and Mrs M.A. Carpenter of Sulgrave. He was a private in the 7th Battalion of the Royal Fusiliers. At the age of 19 he was killed on the Western Front in France on 20th March 1918. Having no known grave, his name is commemorated on the Arras Memorial in the town of the same name together with almost 36,000 other servicemen from the United Kingdom, South Africa and New Zealand who died in the Arras sector between the spring of 1916 and 7 August 1918. Given the date of his death he would almost certainly have died in resisting the last great German offensive in the Spring of 1918. Albert Franklin and Frederick Wade are linked together here because they were both in the 1st Battalion of the Oxfordshire and Buckinghamshire Light Infantry and died within months of each other in the same theatre of war. Albert Franklin was a Lance Serjeant (contemporary spelling) in that battalion. He died in Mesopotamia (present day Iraq) on the 12th November 1915. He was the son of William Henry and Mary Anne Franklin. Frederick Wade was a private in the battalion. He died on the 7th April 1916, also in Mesopotamia. His age is not given. 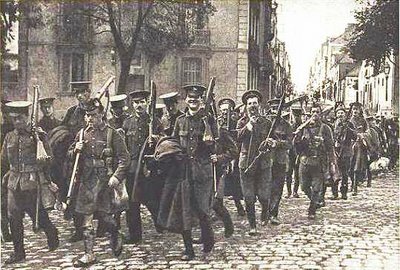 They were volunteers who joined up before conscription was introduced in January 1916. Were they perhaps friends in the village who decided to “go and do their bit together”? They and 40,500 others with no known graves are commemorated on the Basra Memorial in Iraq. Allied operations in Mesopotamia were against the Turks, staunch fighters and allies of the Germans. It seems likely that Albert Franklin was killed during the allied advance from Basra towards Kut-el-Amara and Frederick Wade during the First Battle of Kut, said to have been the greatest humiliation to have befallen the British Army in its history leading to demands for a parliamentary inquiry into what had gone wrong in Iraq! W Fenemore was a gunner with “B” Battery of the 74th Brigade of the Royal Field Artillery. He died on the 26th July 1917 and is buried in Bleuet Farm Cemetery near the village of Elverdinge in Belgium. From the date of his death and the location of the cemetery it seems likely that he was a casualty in the Third Battle of Ypres, otherwise known as Passchendaele. 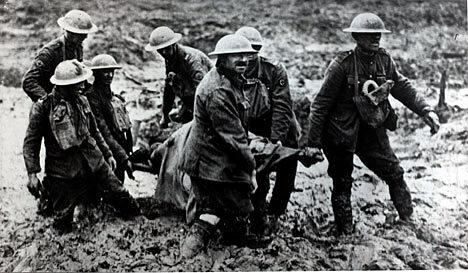 Ground conditions during the whole Ypres-Passchendaele action were atrocious. Continuous shelling destroyed drainage canals in the area, and unseasonable heavy rain turned the whole area into a sea of mud and water-filled shell-craters. The troops walked up to the front over paths made of duckboards laid across the mud, often carrying up to one hundred pounds (45 kg) of equipment. It was possible for them to slip off the path into the craters and drown before they could be rescued. The trees were reduced to blunted trunks, the branches and leaves torn away, and the bodies of men buried after previous actions were often uncovered by the rain or later shelling. Robert Hadley was a Royal Navy sick berth attendant on HMS Invincible. He was killed at the Battle of Jutland on 31st May 1916 at the age of 32. 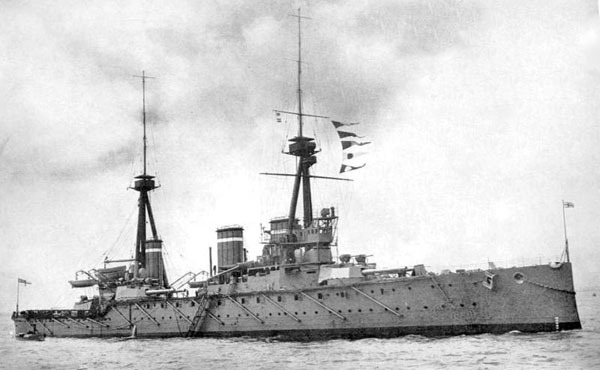 HMS Invincible was the flagship of the 3rd Battlecruiser Squadron. She was hit in her “Q” turret by a salvo from the German battleship Lutzow which blew the roof of the turret over the side. It was either this shell hit which caused a flash down the magazine or a second shell in the same salvo that penetrated the armour and exploded in the magazine, causing a massive explosion. The ship broke in two and sank with the loss of all but six of her crew of 1,021. Jutland was the last, and largest, of the great battleship battles. Never again did battle fleets meet again in such numbers. While the Royal Navy suffered more losses, the battle effectively ended any threat from the German High Seas Fleet, which now knew it could not contest control of the North Sea with the Royal Navy. 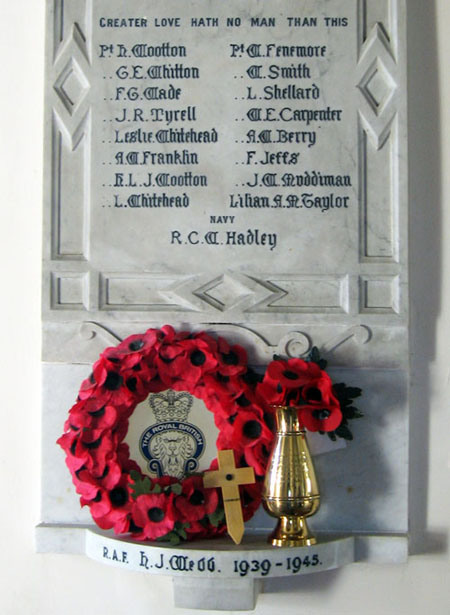 Frank Jeffs was a private in the 5th Battalion of the Royal Inniskilling Fusiliers. He died on the 26th October 1918 at the age of 22. He was the son of Charles Owen Jeffs and Sarah Elizabeth Jeffs, of Sulgrave. He is buried in Ste Marie Cemetery, Le Havre, France. During the First World War, Le Havre was one of the ports at which the British Expeditionary Force disembarked in August 1914. 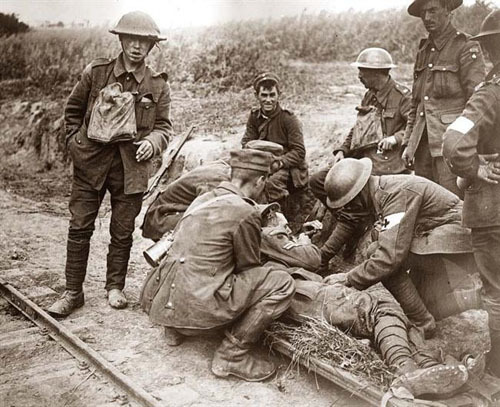 Except for a short interval during the German advance in 1914 it remained No 1 Base throughout the war and by the end of May 1917, it contained three general and two stationary hospitals, and four convalescent depots. In all 1,689 Commonwealth casualties of the First World War are buried or commemorated in the cemetery. It seems conceivable that Frank Jeffs died of injuries at one of the hospitals in Le Havre. No one knows, but at 22 he was perhaps already a “veteran” in a conflict where boys became men overnight. He may have soldiered on through several years of the war only to die so near to home and a mere 16 days before it all came to an end. J.W.Muddiman was a driver in the Royal Engineers attached to the 10th Divisional Headquarters in Greece where he died at the age of 36 on the 23rd June 1917. He was the husband of Emily Muddiman of Sulgrave. He is buried at Lahana Military Cemetery in Greece, about 56 kilometres north-east of Thessalonika. 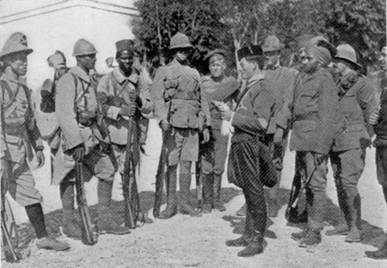 In October 1915, a combined Franco-British force of some two large brigades was landed at Salonika (today called Thessalonika) at the request of the Greek Prime Minister. These included the 10th (Irish) Division to which Driver Muddiman was attached. The objective was to help the Serbs in their fight against Bulgarian aggression. But the expedition arrived too late, the Serbs having been beaten before they landed. It was decided to keep the force in place for future operations, even against Greek opposition. It is impossible to draw any conclusions as to the fate of J.W.Muddiman in this complex and little known theatre of war but it was said of the Salonika campaign that for every casualty of battle three died of malaria, influenza or other diseases. 60984 Sjt. R. Shepherd; R.F.A. (Beverley). As the entry in the London Gazette states, the Military Medal was awarded to Non-Commissioned Officers and Men and, it seems, there was sometimes only one copy of the citation setting out the reasons for the award. It is not known if Leonard Shellard gained the award before his death or if he died in gaining it. Sadly, it seems possible that his relatives in the village might never have known of his bravery. Certainly, there is no mention of his award on the memorial plaque in the church. 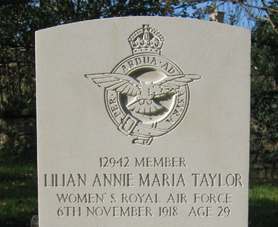 Lilian Taylor is commemorated both on the memorial plaque in the church and on a Commonwealth War Graves Commission headstone in the churchyard, as shown in the picture below. 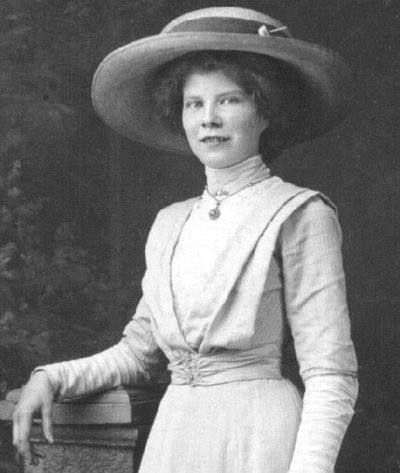 The War Graves Commission records add that she was the daughter of William and Harriet Taylor, of Sulgrave. Lilian in her Women’s Royal Air Force uniform. The Taylors are a very old established family in Sulgrave and Lilian’s nephew Donald is a familiar sight in the village today. His father told him that she had served in France during the Great War and died of influenza at the end of it. 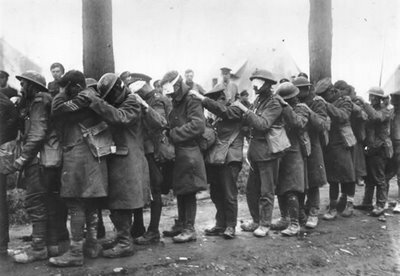 More than 40 million people world wide died in this dreadful epidemic and it is said that there were more deaths in Britain from it than from the Great War itself. Since the headstone is in the churchyard it can only be assumed that she came home very ill and died in the village. Leslie Whitehead was a private in the 17th Battalion of the Middlesex Regiment. He died in France on the 1st June 1916 aged 19. He was the son of William and Elizabeth Whitehead, of Sulgrave. 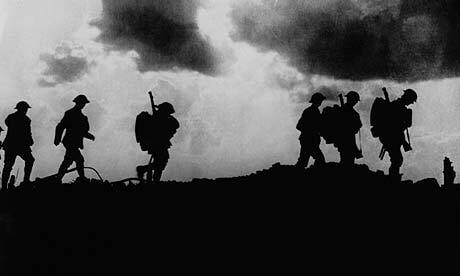 The main event on the Western Front in 1916 was the Battle of the Somme which began on July 1st. Leslie Whitehead was killed in this area a month before the battle began and it is not possible to speculate that he died in any particular action. Leslie Whitehead is buried in the Cabaret-Rouge British Cemetery, Souchez, in the Pas de Calais, France. Souchez is a village 3.5 kilometres north of Arras on the main road to Bethune. The “Cabaret Rouge” was a house on the main road about 1 kilometre south of the village, at a place called Le Corroy, near the cemetery. On the east side, opposite the cemetery, were dugouts used as battalion headquarters in 1916. The cemetery now contains 7,655 Commonwealth burials of the First World War, more than half of them unidentified. 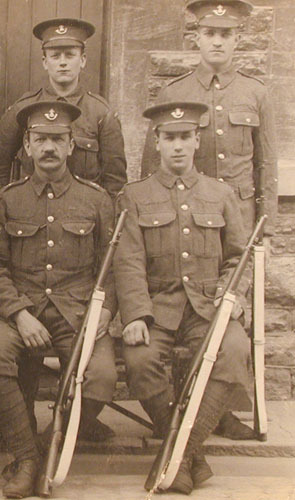 Harold Wootton was a private in the 2nd Battalion of the Oxford and Bucks Light Infantry. He died in Flanders (Belgium) on the 21st October 1914 aged 21. He was the eldest son of Joseph Butlin Wootton and Catherine Elizabeth Wootton, of Little Street, Sulgrave. Prior to 1914 he had been a member of the local yeomanry, the forerunners of the territorial army. In the wave of patriotism that followed the outbreak of war with Germany in August of that year these units waived their right to serve only for “homeland defence” and within weeks he found himself with the British Expeditionary Force in France. Harold and the 2nd Ox and Bucks arrived on the Western Front as part of the 5th Infantry Brigade, 2nd Division– one of the first divisions of the British Expeditionary Force to arrive in France. 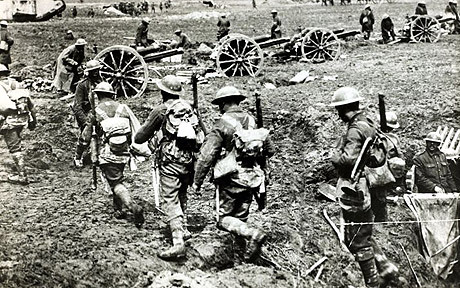 The Battalion took part in the first British battle of the war, at Mons where the British defeated the German forces that they had encountered on 23rd August. The Battalion subsequently took part in the retreat that began the following day, then halting the German advance at the First Battle of the Marne (5th to 9th September). The 2nd Ox & Bucks later took part in all the subsidiary battles of the First Battle of Ypres (19th October to 22nd November) that saw the heart ripped out of the old regular army, with over 50,000 casualties. Harold Wootton was killed at the height of this battle, attempting to stem the German advance at the tiny Belgian village of St Julian. This village, today known as St. Juliaan, can be found a little to the north-east of Ypres, on the N313. Here and at nearby Langemarck was where, in the words of the military historian G.S. Hutchinson, “the tiny army of seven Divisions of 1914 stood it’s ground before the pick of the world’s greatest military force”. 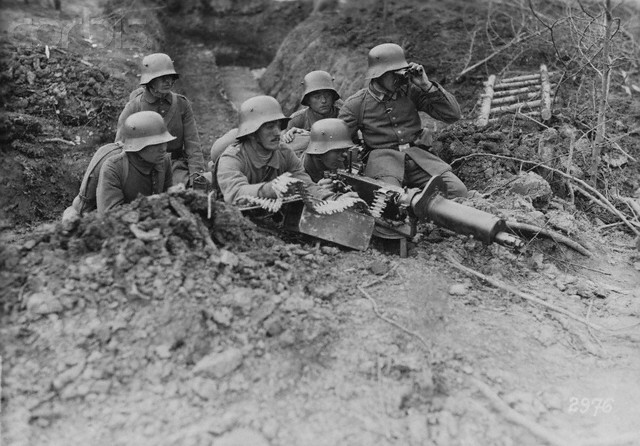 It is said that the rate of fire and accuracy from their bolt action rifles convinced the Germans that they were equipped with machine guns. Largely as a result of superior German field artillery at the time, the bodies of Harold and many of his comrades were never identified and his name is commemorated on the famous Ypres (Menin Gate) Memorial with 54,000 others with no known graves. H.L.J. Wootton was a private in the 1st/15th Battalion of the London Regiment (Prince of Wales’ Own Civil Service Rifles). He died on the Somme Battlefield in France on the 7th October 1916, aged 20. He was the son of Leonard Henry and Rhoda Jane Wootton, of 8, Council Houses, Sulgrave. He is commemorated on the Thiepval Memorial to the Missing of the Somme, which bears the names of more than 72,000 officers and men of the United Kingdom and South African forces who died in the Somme sector before 20 March 1918 and have no known grave. The Thiepval Memorial is off the main Bapaume to Albert road (D929). Each year a major ceremony is held at there on 1 July. On 1 July 1916, supported by a French attack to the south, thirteen divisions of Commonwealth forces launched an offensive on a line from north of Gommecourt to Maricourt. 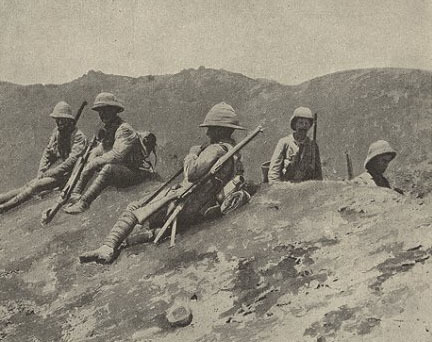 Despite a preliminary bombardment lasting seven days, the German defences were barely touched and the attack met unexpectedly fierce resistance. Losses were catastrophic and with only minimal advances on the southern flank, the initial attack was a failure. In the following weeks, huge resources of manpower and equipment were deployed in an attempt to exploit the modest successes of the first day. However, the German Army resisted tenaciously and repeated attacks and counter attacks meant a major battle for every village, copse and farmhouse gained. At the end of September, Thiepval was finally captured. The village had been an original objective of 1 July. Attacks north and east continued throughout October and into November in increasingly difficult weather conditions. It can be surmised that it was during one of these autumnal attacks that Private H.L.J. Wootton was killed. Hector John Webb was a Leading Aircraftman in the Royal Air Force. 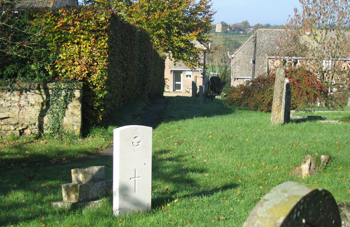 He is the only serviceman from the Second World War to be mentioned on the Sulgrave memorial. There is no information on any relative in the village in official records. He served in Malaya during the war against Japan. There is no record of his age. He died on the 29th November 1943 and the manner of his death makes for sober reading. He is commemorated on the Memorial in Kranji War Cemetery, 22 miles north of the city of Singapore. On 8 February 1942, the Japanese crossed the Johore Straits in strength, landing at the mouth of the Kranji River within two miles of the place where the war cemetery now stands. On the evening of 9 February, they launched an attack between the river and the causeway. During the next few days fierce fighting ensued, in many cases hand to hand, until their greatly superior numbers and air strength necessitated a withdrawal. After the fall of the island, the Japanese established a prisoner of war camp at Kranji. It would have been here or in Changi that Hector Webb spent the next twenty-one months as a prisoner of war of the Japanese. This entry was posted on Sunday, November 1st, 2015 at 9:54 am	and is filed under News. You can follow any responses to this entry through the RSS 2.0 feed. You can leave a response, or trackback from your own site.